Emerging from banks that a few short weeks ago were submerged by water, the upright flower stalks and parasol leaves of the Butterbur are bursting forth down by the ford. 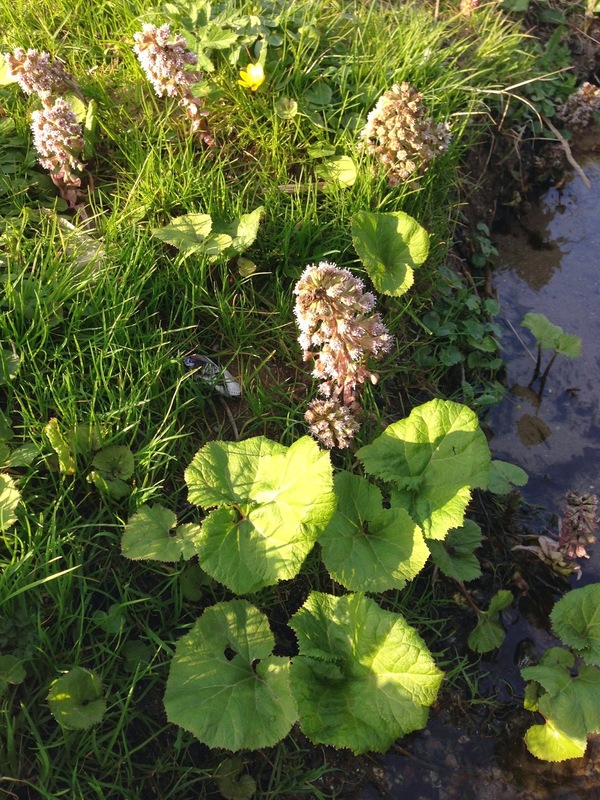 A long-time staple of herbalists through the ages, Butterbur was used to treat plague and fevers in the middle ages and asthma and coughs in the 17th Century. It’s use now can be controversial; chemical analysis reveals potentially harmful alkaloids within, though commercial, ‘safe’ Butterbur products are available for the relief of migraine. Medicine or not it’s appearance is another signal that warmer, longer days are approaching and that vibrancy of spring is upon us. Catch up 2 – might it be a belemnite?